So, how's everyone doing? Alot of you are enjoying Christmas breaks aren't you? Yeah, I'm a little jealous, but something tells me alot of people who are "working" are taking it a bit easy. Me? Yeah, I'm at work this week, but I ran to the store at lunch to burn up a few coupons that are about to expire. Today's treat is brought to you by the coupon I got when I complained about Haagen-Dazs Five Brown Sugar ice cream. What did I pick to replace it? 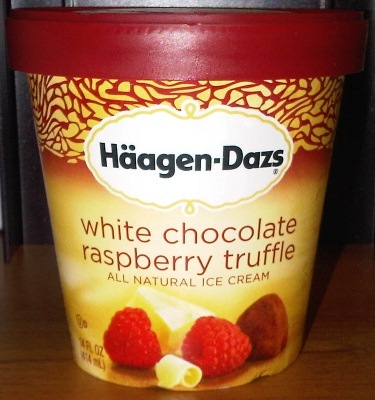 I was looking around when I spied the last container of White Chocolate Raspberry Truffle. Hmmm, sounds fancy, let's look for the description: White Chocolate ice cream swirled with tangy raspberry ribbons and satisfying chunks of chocolate fudge truffle. Wow, now that sounds impressive! Oh, that looks pretty good with lots of swirl and lots of truffle bits, I just hope that swirl isn't too tart. Let's find out! I head right for the swirl... mmmm, interesting, got a truffle too. Oh man, truffles everywhere! They are somewhat soft and kind of have a thud to them. Ok, trying to bite just the base ice cream. I think I'm getting white chocolate, but it's subtle, which isn't necessarily a bad thing, though I wouldn't mind it being a bit stronger. I'm attacking the swirl again. This ice cream has been melting for a little while but the swirl is still solid. It's definitely not some sweet, liquidy swirl. Well, it's sweet, but not sugar sweet, it's more natural than that... not that sugar isn't natural... oh I'm stuck in a description loop. How come these flavors always remind me of Turkey Hill's low fat raspberry chocolate chunk? Oh, nice, I just had the most tasty truffle bit. Why can't they all taste like that? 25% fat, 45% sat fat, 30% cholesterol... and I can totally picture eating this whole pint. 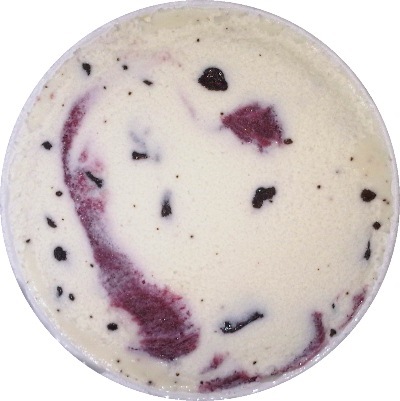 This is some well made ice cream, though part of me wishes I could try it without the raspberry, though then it would probably taste too much like a plain vanilla ice cream. Phew, ok, it's in the freezer. It had melted a bit so it was going down way too easy. Overall I like it. If I want to get picky, I'd say the term white chocolate is a little... vague? It doesn't taste like vanilla, but at the same time, it doesn't not really taste like vanilla... Wow, are my writing skills on vacation? On Second Scoop: Well I just had my second and final helping of this flavor and it's a shame it's gone. It's such a well made ice cream that goes done so well. It's different and I enjoyed it, what else can I say? This is my favorite flavor of ice-cream ever. I love it. My absolute favorite. Really hard to find where I live tho. I was shocked to find at Walmart the other day.